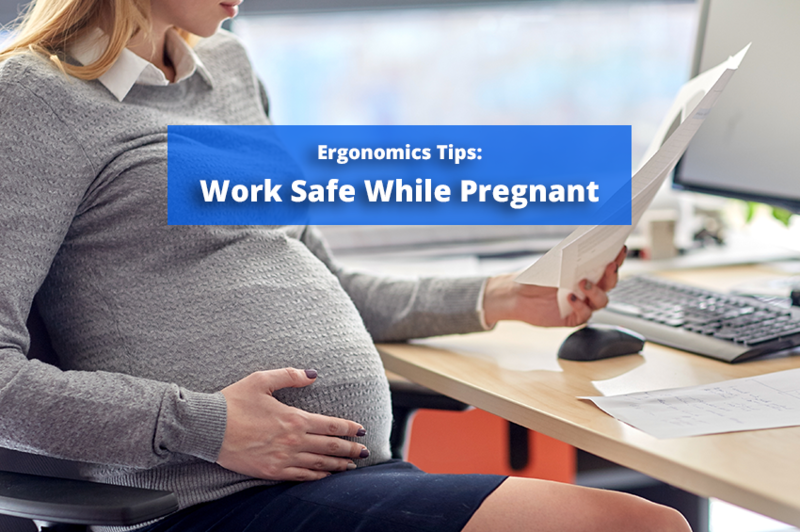 Ergonomics Tips: Work Safe While Pregnant - Solutions Northwest, Inc. While pregnancy is generally a joyful time, it can impact your safety outlook in the workplace. Considering that “more than half of new mothers are employed” according to Workcare, it is important to discuss any possible job hazards with your employer and educate yourself on what hazards to look out for and how to avoid workplace injury. There are many temporary adjustments and additional precautions workers can take to stay safe when working while pregnant. What are some of the workplace hazards to look out for? As with all safety issues, it is important to always speak with your doctor. Additionally, you should never hesitate to speak to your workplace administrator or human resources department for assistance specific to your job tasks. “Changes in your metabolism increase how quickly you absorb some chemicals (e.g. some metals). Because of physical changes, the personal protective equipment that you could wear correctly before pregnancy may not fit properly, such as lab coats or respirators. When pregnant, changes in your immune system, lung capacity, and even ligaments can alter your risk of injury or illness due to some workplace hazards. During pregnancy, women experience fluid retention, which may cause vulnerability to De Quervain’s tenosynovitis, which is an inflammation of the fluid-filled sheath that surrounds the tendon, especially if a repetitive job is involved. Outside of the workplace, new mothers experience wrist and thumb pain from lifting their baby or holding their baby’s head during feeding. Additionally, the CDC.gov website provides job specific examples at: https://www.cdc.gov/niosh/topics/repro/pregnancyJob.html. It is also recommended that employers perform a worksite-specific evaluation of hazards and contact an ergonomics specialist for an ergonomics assessment. What can you do to avoid injury? Aside from getting plenty of rest and not overworking, communication with your employer is key. It is important to communicate with your employer and learn more about their safety protocols as well as your safety options as a worker. Once you notify your employer, they should be trained to provide accommodations for you and be open to providing any additional, reasonable accommodations needed. Additionally, it may be necessary to contact an ergonomics expert to ensure that your workstation (for example, a computer desk) is properly adjusted to your needs. SolutionsNW.com recommends that pregnant workers visit https://www.eeoc.gov/eeoc/publications/pregnant_workers.cfm to review their legal rights in the US. Due to several workplace protections set in place for pregnant workers, you should have a positive experience. If you are the workplace admin or work in the human resources department, be sure that your workplace is properly prepared for pregnant employees by knowing the laws listed by the ADA, the CDC, and OSHA. It is also a good idea to have experts on standby, for example, for any ergonomics issues you may encounter, you can contact an ergonomics specialist to assess your workplace and ensure your workstations are flexible for a variety of workers.